Guillaume “nolet20” Nolet among big winners this weekend after topping a partypoker KO Series event. Canada's Guillaume "nolet20" Nolet added another title to his poker résumé on June 3 when he came out on top in the partypoker KO Series #03-HR: $500K Gtd Championship Event to walk away with more than $100,000. Nolet is a top grinder and can brag about victories in the PokerStars MicroMillions Main Event and the PokerStars Super Tuesday. He has reached a WCOOP final table before, too. Now he has a KO Series win under his belt. There were 447 entries in the KO Series #03-HR: $500K Gtd Championship Event NL Hold'em, with those finishing in the top 56 spots getting a share of the $500,000 prize pool. A min-cash was worth $1,525 plus any bounties the players picked up, while a final table appearance meant at least $4,735 would be won. That was the sum "DaviAugusto" collected for finishing in eighth place, plus another $3,185 from the bounty prize pool. "StillTrying" may have crashed out in seventh for $6,501, but only after sending players to the rail at an impressive rate beforehand. StillTrying collected a total of 17 bounties, the most of anyone in the tournament, worth $10,172. Mike "Ilove2fish" Telker next busted in sixth place with Jerry "frokennatur" Odeen following in fifth. The United Kingdom's Michael "mczhang" Chi Zhang, who has been on an incredible run of late, then went out in fourth for $17,658 plus $8,165 from bounties. Partypoker ambassador Patrick "Patrick_Leonard" Leonard then fell in third place for a total takeaway of $28,367, leaving "teachmesir" and Nolet to lock horns heads-up. Nolet eventually sent his last opponent to the rail to scoop $51,104 from the prize pool and $55,449 in bounties, which included the bounty on his own head. Meanwhile there was a $65,400 overlay in the other KO Series Championship Event after 848 players turned out to play the $500,000 guaranteed event. Player "whodatt." took full advantage of the added prize money and bulldozed to victory. The eventual champion walked away with $40,537 in bounty payments thanks to eliminating 21 players on the way to winning. That was almost double the amount of runner-up "BackDoorMat" and fourth-place finisher "KONY2012" who both sent 11 players to the showers. UK's Rick "tHeClaImEr1" Trigg also busted 12 opponents on his way to finishing 14th. We've already mentioned BackDoorMat and KONY2012 who reached the final table. The other finalists were "VamosAlaPlayaR" in sixth place, "robdag83" in fifth place and Steve "MozzAA" Morris who finished in third for a total of $31,120 while streaming live on his Twitch channel. Romania's "caddyjust66" collected $143,707 after outlasting a field of 5,318 entries in the latest PokerStars Sunday Million. The nine-handed table was a star-studded affair and any of the finalists would have proven to be a worthy champion. "Pthelegend," a four-time COOP finalist, fell in ninth place and banked $8,453. Sweden's "TanTanSWE" fell in eighth place with Norway's "Camari" falling in seventh. Camari has previously reached the final table of the Sunday Million, but again fell short of victory. Brazilian star Yuri "theNERDguy" Martins, a player with millions in online cashes, busted in sixth, then former SCOOP winner "Gabse92" exited in fifth after an attempted blind steal with king-eight was called by "needdollarz" who had the dominating king-ten. Fourth place went to Ciprian "CipiV" Voican whose three-bet all-in with was called by needdollarz who had ace-king. Voican flopped an open-ended straight draw, which never came in, and needdollarz turned a king to earn the knockout. Former Sunday Warm-Up and Sunday Million champion needdollarz was then eliminated in third. After seeing "gabsdrogba" double through with ace-jack against a pair of red tens, needdollarz limped in from the small blind with and gabsdrogba checked from the big blind with . Needdollarz fired a 700,000 bet on the flop, 2,010,000 on the turn, then jammed all in for 7,000,000 on the river. Gabsgrogba called each bet and their pair of tens was enough to send the tournament into the heads-up stage. Caddyjust66 won a big pot without showdown to grab a 3-to-1 chip advantage. The Romanian was constantly stealing and one such steal attempt with was called by gabsdrogba's . The flop put gabsdrogba into the lead and the kept him there. 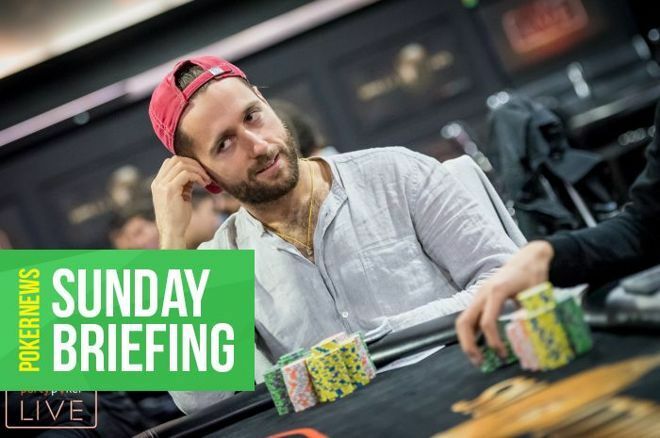 The river, however, completed an unlikely flush for caddyjust66 and with that this week's Sunday Million title headed to Romania. The Sunday High Roller saw its $100,000 guarantee more than doubled after 108 PokerStars players created a $216,000 prize pool. Former European Poker Tour Prague champion Julian "jutrack" Track was the nine-handed final table's first casualty, a finish worth $5,988. Hungary's Laszlo "omaha4rollz" Bujtas joined Track on the sidelines a short time later after finishing eighth, after which Russian star "EvnomiYa" finished seventh for $9,015 and Canada's Daniel "Oxota" Dvoress fell in sixth to bank $11,973 and the first five-figure score awarded in the tournament. The prize money kept rising as more players fell by the wayside. "SwalzB", "BShahbaz" and Johannes "Greenstone25" Korsar crashed out in succession to scoop prizes of $15,902, $21,119, and $28,047, respectively, and reduce the field to two. Korsar's exit left Argentina's "ramastar88" and "OLD TIME GIN" of Canada to battle heads-up for the title and the $49,470 top prize. Ultimately OLD TIME GIN claimed the win and near $50,000 haul, leaving the Argentinian to walk away with the $37,249 consolation prize. It was a Canadian one-two in the 888poker $100,000 Whale this weekend as Sebastian "p000cket000" Sikorski and "T54_IS_A_FAG" walked away with a combined $50,000 of the $100,000 guaranteed prize pool. There were plenty of stellar names at the final table, as you would expect from a $1,050 buy-in tournament, with the likes of Johannes "TrollKonst8" Korsar, Sam "sammygrinder" Grafton, and Marc "icallyamet" Wright featuring among the final nine. But the man of the hour was Sikorski, who now has more than $11.5 million in online winnings as he emerged triumphant to bank $30,000 for his $1,050 investment. Finally, Germany's "amaze1" and Slovenia's Ivan "Hurrrican3" Gabrieli chopped this weekend's $100,000 Sunday Mega Deep after they found themselves heads-up for the title. Credit for the win goes to amaze1, an accolade that came with a $17,434 prize with Gabrieli taking home $16,565 for their runner-up finish.